Gilpin Realty of Snohomish has embraced change to survive market volatility and downturns. This year Jeff and Gabe Gilpin are celebrating Gilpin Realty’s 50th anniversary and three generations of family ownership. That’s quite a feat considering that fewer than one-quarter of all U.S. companies are in business after 20 years, according to the U.S. Bureau of Labor Statistics. The percentage that reach the half-century mark? Less than 10 percent, by some estimates. When it comes to golden anniversaries, Gilpin is ahead of Microsoft. The software and technology developer won’t be breaking out the party-ware until 2025. Starbucks turns the big Five-O in 2021, and Funko, the Everett-based maker of popular culture toys, is barely 20. Adam Brockman, a Seattle business owner, has used Gilpin for several transactions. In 2017, Gilpin Realty was involved in nearly $67 million worth of real estate deals, thanks to 26 brokers and three employees. Companies with fewer than 99 workers employ about 38 percent of the state’s workforce, according to a recent report by the Association of Washington Business. “We try to keep our brand local,” supporting local businesses and local sports teams, said Stephanie Bischoff, Gilpin’s office manager and herself a broker. “We have that small town feel and know the area,” Bischoff said. “People reach out to us because they want a local, independent real estate firm,” she said. That approach can work well, said Diane Kamionka, interim executive director at the Northwest Innovation Resource Center, based in Bellingham. “There’s a lot of community loyalty here,” she said, referring to Snohomish County. Gilpin Realty’s story begins five decades ago with Jeff Gilpin’s mother (Gabe Gilpin’s grandmother), the late Freda Gilpin. Freda and her husband, Paul Gilpin, owned a sporting goods store in Snohomish beginning in the mid-1950s. By the mid-1960s, however, they saw the “writing on the wall,” said their son, Jeff Gilpin, 70. The big box stores had moved into the area and were hawking fishing poles at prices lower than what the Gilpins paid wholesale. Time to sell the store. Business took off, enough so that Freda’s husband, the late Paul Gilpin, could join the company full time. Her next move was trying to convince her son, Jeff, to hop aboard. 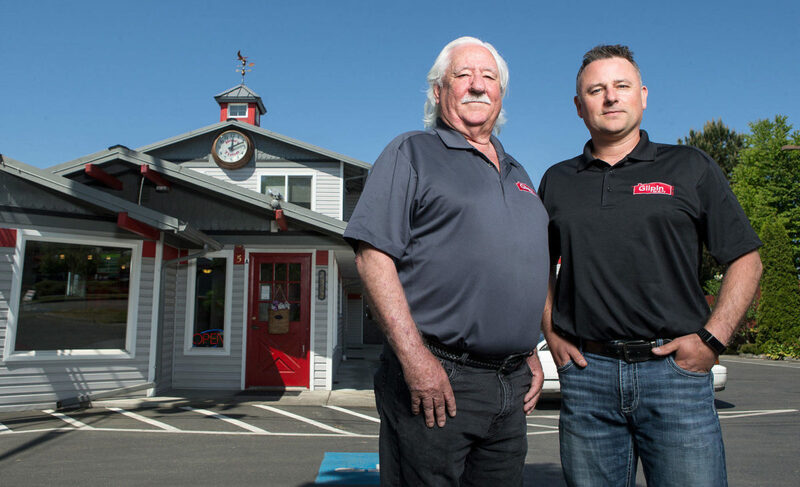 Passing the family business from one generation to the next isn’t always an easy sell. In 1969, fresh out of the Army and unsure of a career path, Jeff Gilpin wanted bright lights and big cities, or so he thought. Offered a job with New York City-based Paramount Records, he peddled new recordings to radio stations on the East Coast. Jeff Gilpin lived out of a suitcase for 12 weeks. When the perks and glamour he envisioned failed to materialize, he called it quits. “I was just a farm boy from Snohomish,” Jeff Gilpin said of the punishing three-month stint. He returned home and joined the family business. Airline purchases stalled. Then, in May 1971, Congress cancelled funding for Boeing’s Supersonic Transport aircraft project, against the wishes of President Richard Nixon. Boeing laid off nearly 60,000 workers, slashing its Puget Sound workforce from 101,000 in 1968 to 42,000 by 1972. In Everett, the employee count plummeted from 25,000 to 7,000 — just a few years after the airplane maker had set up shop at Paine Field. The unemployment rate hit 14 percent, the highest in the nation. The infamous billboard, “Will the last person to leave Seattle — Turn off the Lights,” appeared near Sea-Tac Airport. It was a savvy business move, bringing in revenue as sales declined, he said. When Jeff took over the helm after his father’s death in 1994, Gilpin Realty had passed the 25-year mark and entered the second generation of family leadership. But the likelihood that a third-generation would steer the company looked dim. Gabe Gilpin balked at joining the family firm. Childhood memories of lingering in the real estate office, waiting for his father to close a deal, left him cold. “I remember being there for hours on end, wondering, ‘When can we leave?’, ” recalled Gabe Gilpin, now 42. After high school, Gabe became involved in the construction and development industry. In 2005, he decided to give real estate sales a try, but only as a side gig. Success followed. In 2008, he accepted his father’s offer to help manage the office, which by then employed more than a dozen, including some agents who’d been with the company for 30 years. Concerns that Gabe’s arrival might be met with resentment proved unfounded, Jeff said. Like his father, Gabe’s introduction to the family business was accompanied by an economic downturn, the Great Recession. Gabe’s response to a feeble real estate market was to boost the company’s property management services. In short order, Gabe tripled the number of properties the firm managed, Jeff said. “He taught everyone how to make money during a downturn and earned everyone’s respect,” Jeff explained. Gilpin Management eventually became a separate company. Last year it managed $68 million worth of properties in King, Snohomish and Skagit counties. Four years ago, Gabe took the reins from his father, Jeff, who retired after 47 years. Not all home purchases are happy events. For some, divorce or death drive the sale of a house or prompt a search for new living quarters, Gabe said.